Sacramento (#) (1864-1872), a 270-foot side-wheel passenger steamer that met her end hitting a then uncharted reef of Isla San Geronimo, Mexico. Captain, crew and all 145 passenger were safely landed on Isla San Geronimo. The Montana, which had just arrived at San Diego, was sent to pick up the passengers of the ill-fated Sacramento..
Captain Farnsworth and four of his crew remained with the wreck until December 17th, when they were finally taken off by the salvage steamer Fideliter. They had done, in the meantime, an exceptional good job of picking the Sacramento’s bones, having recovered silverware, canvas, furniture and hand-tools and the small auxiliary machinery from the flooded engine-room. The main engine, of course, was too large to handle, and until just a few years ago its gallows-frame, walking-beam and main shaft remained visible at low tide, protruding from the water like some ghostly sentinel. Gradually the massive timbers fell away by disintegration, but the heavy shaft still protrudes even to this late day, forlornly above the water, marking the resting place of the wreck after more than ninety years. 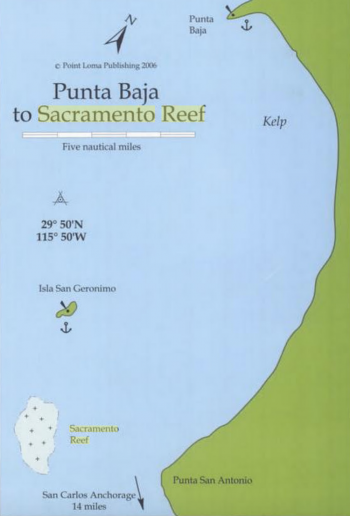 Sacramento Reef is so named for the 1872 accident of the side-wheeler, Sacramento. The reef is 2.5 miles wide, including a detached 18 foot spot, and 2 miles long. It runs in a northwest to southeast direction and the north edge lies 2 miles off the southern tip of Isla San Geronimo. Triangulation and soundings by the survey-steamer Hassler and the U.S.S. Ranger resulted in a raising of the accuracy of future nautical charts which had long been overdue. From that period on, coastal voyages became safer off the West Coast—but "Sacramento Reef", even to this day, is a good place to avoid, as many a subsequent navigator has discovered, the hard way. On May 25, 1969 the 161-foot navy schooner, USS Palomas [Goodwill], ran aground on the reef.